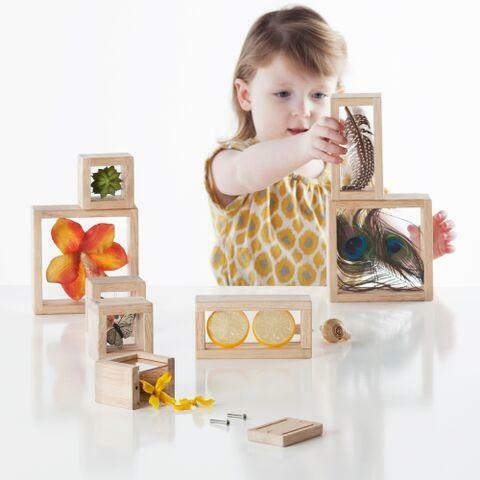 Collect trinkets, natural materials and sensory objects to place in this beautiful set of 8 Treasure Blocks. Smooth hardwood frames with inset, transparent acrylic windows have a removable panel to place small objects to observe or display. Ideal for color exploration and light table activities. Holds marbles, beads, twigs, leaves, small toys and more. Two screws on the removable panel keep objects securely in place until ready to be replaced. Dimensions: Largest Block - L: 5.5" x W: 5.5"